If you are interested in bringing Montessori into your home, or you are looking for ways to teach practical life skills you came to the right place. You’ll find 30 Days of Montessori Activities for toddlers and preschoolers. 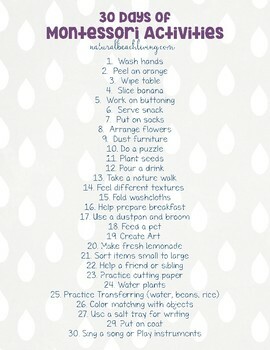 A variety of ideas that your child can practice. Everything from buttoning their shirt to helping prepare a family breakfast. You’re in for 30 days of lifelong skills.